My high school 20th reunion was this past weekend. Let me just let that sink in for a moment. 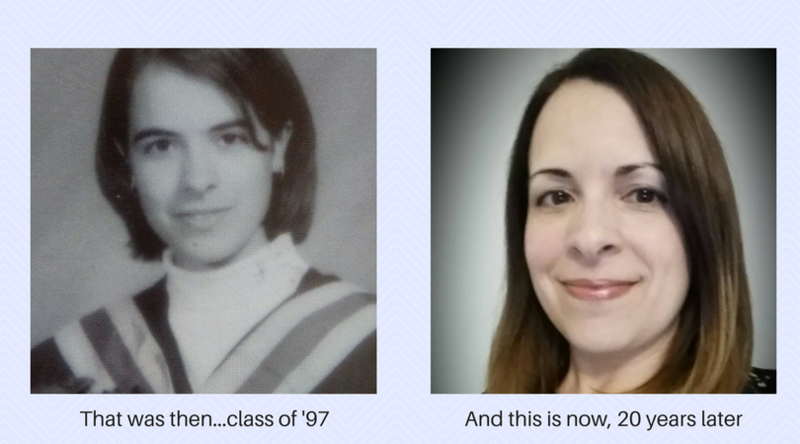 It has been 20 years since I graduated high school…20 years! How is that possible? I feel like in a blink of an eye I went from being a teenager to a married mother of two kids. As I walked into the room and saw old familiar faces I felt a sense of nostalgia wash over me. In an instant I was flashing back to a time in my life that was filled with learning, growing, friendships, young love, and teenage angst. It was a time that I felt so sure of what I wanted in life and yet so unsure of myself all at once. But most of all, as I look back on it now 20 years later, it was a time in my life filled with people and memories I won’t soon forget. Walking through those school halls again was surreal. With each area of the school, I passed memories flooded my brain and it was like I was a teenager again. Catching up with old classmates throughout the evening was surprisingly comfortable despite having not seen most of them for two decades. On my drive home that night I found myself reflecting not only on the evening but also on how much I have changed in the past 20 years. I guess what they say is true; the older you get, the wiser you become. And with the wisdom I have gained I wish I could go back in time and give advice to myself as a teenager. This is what I would tell her. Take chances. Don’t hold yourself back because you aren’t sure you are good enough. You won’t know unless you try. Want to join a sports team? Try out for it. Interested in that choir solo? Audition for it. You know that cute, funny boy that you like hanging out with? The one you think only sees you as a friend? Ask him out! The best experiences in life are worth taking chances for. Have more confidence in yourself. Take the words “I can’t” out of your vocabulary. You are a talented young woman who has a lot to offer. Believe in who you are and the abilities you have. Stop thinking it’s too late to learn new things because it is never too late. Don’t hesitate to go for that job you really want because you think you don’t have what it takes. Get that interview and impress them with your talent. Be adventurous. Live a little! 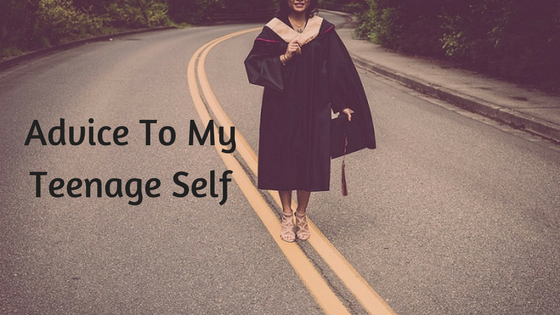 I know you feel like you need to be responsible and work hard for what you want in life, and it is true that you need to do those things, but you are only young once. This is the time for you to get out there and experience new things. Travel, learn a new skill, get a tattoo, get out of your comfort zone once in a while. Life is too short to take seriously all the time, so get out there and have fun! Open up more to others. I know you feel like you need to guard yourself because you don’t want to get hurt, but you put up those walls as a child because of being bullied. It’s time to take the walls down and really let yourself be you. This will only allow you to build better friendships. It will also help where romance is involved. Don’t settle for guys you know deep down are not worthy of your love and trust. Open your heart even if it scares you. Yes, you will get your heart broken but you can pick up the pieces and try again. Trust me, it will be worth it. Since going back in time is not an option I guess these lessons I’ve learned in my life so far will be passed along to my son and daughter, rather than my teenage self. At least I can think about her and smile — because you know what? She turned out pretty good.